This piece originally appeared on Huffpost website on April 18. Kailyn: Bernie Sanders has popularized the idea of democratic socialism to an audience of millions. How important is it that Bernie Sanders has called himself a democratic socialist? Kshama: Whether or not you agree with Bernie Sanders’ version of socialism, it is enormously significant that, for the first time in US history, a presidential candidates who calls himself a socialist has had an actual shot at winning the presidential election. And to his credit, he has not backed down from the label. He has shown that socialism is no longer the barrier that it used to be during the Cold War. In fact, his campaign has demonstrated there is incredible interest in socialism, particularly among young people. This is a sea change. Kailyn: How would you define democratic socialism? Kshama: Socialism is a society where the resources are used democratically to provide a better life for all, based on ending the dictatorship of big business over the economy and politics. Today, we live in a world of incredible wealth and technology, alongside the most horrendous conditions of poverty, war and environmental crisis. This is result of capitalism, a system based on prioritizing profits not human need where the wealth is concentrated in the hands of a capitalist elite. Kailyn: Is this what Bernie Sanders means by socialism? Kshama: What Bernie Sanders is calling for is incredibly important. Things like a $15/hour minimum wage, single-payer healthcare, taxing the rich, and free education. The radical reforms he has popularized are a key part of any socialist program today. But Bernie’s socialism is limited to redistributing wealth through expanding the public sector within the framework of a capitalist society. For us, socialism is a fundamentally different social system where the world’s resources are not controlled by a greedy, undemocratic oligarchy. This is not the same as the capitalist welfare states that have existed in some European countries. Bernie talks about socialism in Scandinavia, and he’s correct to point to the huge victories the working class has won there through struggle, such as socialized medicine, free college education, and paid family leave. But if you talk to working people in Sweden or Norway today, you will find out that many of those past gains have been eroded and some virtually eliminated, including massive under-funding of healthcare and other public services and a return to for-profit systems that are unaffordable to working class people. This is what happens under capitalism – as long as corporations and the super rich own the economy and the politicians, every new generation has to fight hard just to defend itself. Kailyn: Bernie also says that corporations have too much power. How is that different? Kshama: Bernie’s plan for universal healthcare points in the right direction. The for-profit health insurance industry is the main obstacle to delivering high quality, universal healthcare for all. It should be replaced with a single-payer system, a public program that guarantees everyone coverage. However, what Bernie says on Wall Street banks is different. He says that the biggest banks that dominate the economy should be broken up into smaller banks. This would be far more radical than Hillary Clinton’s proposals to regulate Wall Street. But, breaking them up would only be temporary on the basis of capitalism, which is based on ruthless exploitation and competition, and leads inevitably to the development of mega monopolies. Like the healthcare industry, the banks should be taken out of the hands of the 1% and brought under democratic public ownership. Why should a tiny oligarchy have to such power over our economy? How democratic is that? Kailyn: How can working people really have democratic control over the banks and key parts of the economy? 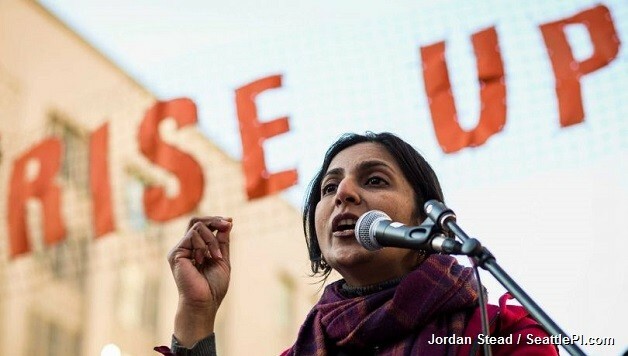 Kshama: As Bernie said in one of the early debates: “Congress doesn’t regulate Wall Street. Wall Street regulates Congress.” I completely agree with that. While we still live in a capitalist society, we of course will fight for whatever reforms help make life better for working people. But, the underlying issue is the system of capitalism itself, and under this system the best means for regulating or checking their power is not relying on a government which represents the interests of the rich but for millions of working people to become politically active in workplaces and communities through building unions and our own political party. To break the power of the big corporations, we would propose that the biggest 500 corporations that dominate the rigged economy and political system should be taken into public ownership, and run democratically. We propose radically extending democracy into the economy and workplaces, to involve working people in decisions over how resources are used that effect all of us. On this basis, we could develop a democratically planned economy designed to meet the needs of all, not just the 1%. Kailyn: Bernie Sanders has praised the “socialism” of FDR’s New Deal and LBJ’s Great Society. Why do you think these kinds of programs aren’t enough today? Kshama: Let me say two things about that. First, when the New Deal programs were passed in the mid 1930s, millions of workers were joining unions, striking, and occupying factories to fight for a better life. It was this radical labor movement that forced the establishment to make concessions. The programs that came to be known as the New Deal were not simply handed down by the benevolence of FDR and the Democrats. They were fought for. And in the 1960s, it was the similar. You had incredible movements against Jim Crow, poverty and the Vietnam War in the 1960s. The second thing is there is a different historical context today. There is a myth that the New Deal programs on their own pulled the US out of the Great Depression and created the conditions for the economic boom after World War II. As an economist, I can tell you, that is not true. In reality, it was mainly World War II that launched the boom – the massive war mobilization, the horrifying destruction and death caused by it, and then the reconstruction in its aftermath. The US was the only advanced capitalist country that was not bombed during the war. For a whole historic period after the war, US capitalism was the strongest in the world and could afford to concede rising living standards. But that period is over. Today, capitalism faces a deep structural crisis. We’ve seen the weakest economic recovery since World War II, and massive levels of inequality and debt. We have a rotting infrastructure that is literally poisoning children in Flint, Newark and elsewhere. It’s not just an economic crisis that capitalism has created. We also face an environmental catastrophe created by a handful of gigantic fossil fuel corporations. There is plenty of work to do, but big business isn’t investing in rebuilding a green economy for the 21st century. Instead, they put their money into a gigantic financial casino, and when that led to catastrophe in 2008-9, they made us pay for it. Big Oil, Wall Street and big business as a whole – they stand in the way of the kinds of change needed. They are fiercely against the radical reforms Bernie is popularizing. We can win Bernie’s program but only through mass struggle. We won $15/hour in Seattle by activating working people and building a movement independent of big business and the Democratic Party. However, there are limits to reforming a system that is dominated by these massive and rapacious corporations. On the basis of capitalism, victories like raising the minimum wage are only temporary. Big business has many tools to make us pay for the crisis of their system. Again, a permanent and sustainable solution to all the problems facing working people is possible by taking the biggest companies into democratic ownership, and reorganizing the economy on a democratically planned basis. Under such a system we could democratically decide how to allocate resources. We could rapidly transition away from fossil fuels, develop massive jobs programs to rebuild the country’s rotting infrastructure, and begin to build a whole new world based on meeting the needs of the majority, not the profits of a few.